A pool leak is a frustrating homeowner issue and locating the leaks is equal parts of knowledge, experience, and science as well as an art. No 2 leaks are the same. It requires patience and the ability to look at a pool and truly understand what's going on. How much is it losing? Is the water stopping at a particular level? Does it leak more when it's running? Is it in the pressure or return side of the pool system or is it just a stagnant leak? These are just a few of the questions that need to be answered on each and every job. In essence, we're looking for issues that are invisible to the naked eye. A pin-hole. A sliver of a hole around a drain or skimmer opening, or a broken line underground that's not even visible without the proper tests and equipment. With 15 years experience sometimes I start to think I've seen every scenario possible as far as leaks go but there's still always something to learn. The image with this post is of a pretty basic and common line break in a spa return, but recently we were challenged with a pool with a dark surface color that was losing 8" per week for almost a year since it was newly constructed. That's quite a loss of water in a relatively short pool life. We pressure tested every line multiple times using both air and water pressure. Every line proved solid. We dye tested every possible feature of the pool multiple times. Around the inside of the drains, return lines, lights, skimmer...everything that was attatched to the pool in every way. Until we turned our attention to the actual pool surface. Inch by inch we checked the pool shell and after a solid 4 hours or searching underwater with dye injectors we found a small hole that went through the wall of the pool! The dark surface made it almost impossible to see. A cleanly bored, 3/16 inch hole in the wall that led straight through to the dirt on the other side about 4 feet down the wall in the deep end. 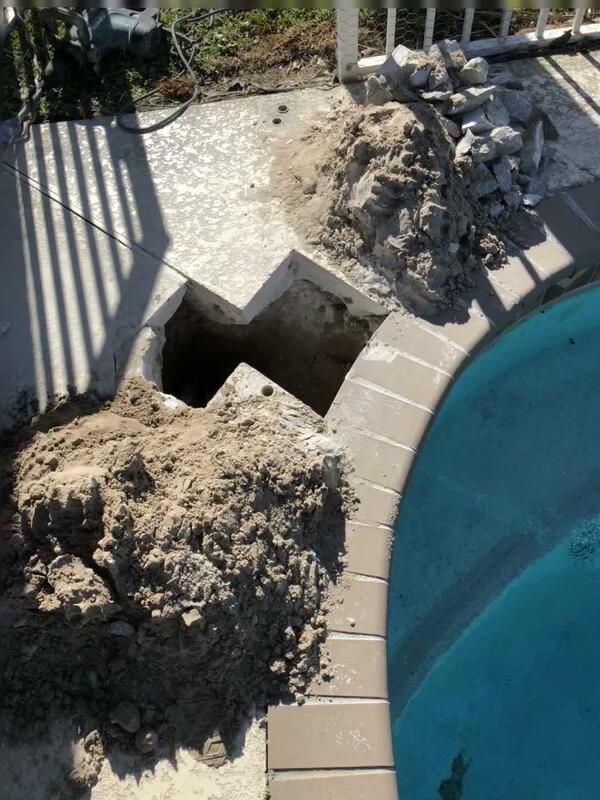 Possibly a completely rare, freak issue, but unfortunately more likely the work of a disgruntled pool construction employee. It reminded of us of how thorough each pool needs to be checked because you never know new situations are still out there. Each pool leak is it's own water conservation puzzle and that's what I truly enjoy. Loose pool coping can be a drag. On top of the obvious safety issues, further damage can result from pool coping in disrepair. Whether you have traditional brick coping, cement coping or any other type, once the pieces start to separate, grout lines start to crack and deteriorate. Those open areas allow dirt, debris, critters, and water to enter into those areas causing not only further damage, but also damage to the tile and top pool beam. The damage can increase exponentially from that point. Some of the causes of loose or lifting coping can include age, deck settling, ground shift, top pool beam shift or missing grout that allows water to enter under the coping. Regardless of whether you have just a few loose, or entire sections, the only true fix is to remove the bad sections and clean and seal the areas. If the existing pieces are reusable, the original mortar and grout ground and cleaned off, and then reset and re-grouted. Contact us today for all your coping needs. Green or yellow algae?? Big difference. Theres are big differences between yellow and green algae and knowing those differences can make treatment much easier. Green algae typically grows in warmer water and starts as soon as chlorine levels drop. It typically brushes off the walls fairly easy and is killed quickly with chlorine. Yellow algae on the other hand is considerably more tenacious. It usually does not brush right off and it wont stop until the root cause is fixed. ...more on that in a minute. It can seem as though you've destroyed it by shocking the pool or using "yellow out" treatments but then it comes right back. Chlorine basically bleaches out the yellow algae temporarily and within 24-48 hours it's color comes right back, often more chlorine resistant than it was. 99% of the time, the cause of yellow algae is PHOSPHATES. This is plant food. It's in some soaps, well water, and rain water in small quantities that build up over time. Its also highly concentrated in fertilizers, urine, and children's bubbles. Phosphate levels are measured in "parts per billion" (ppb). Any phosphates are bad for the pool water but typically in levels over 200ppb, the pool MUST be treated with Phosphate Remover before the yallow algae will die. The treatment dosing is based on pool size and phosphate levels and will cause the pool water to appear very milky for up to a few days. The deactivated phosphates drop to the bottom of the pool and must be carefully vacuumed to the filter, then the filter cartridge needs to be washed thoroughly. Once the treatment is done the dead yellow algae will brush right off and be filtered away. 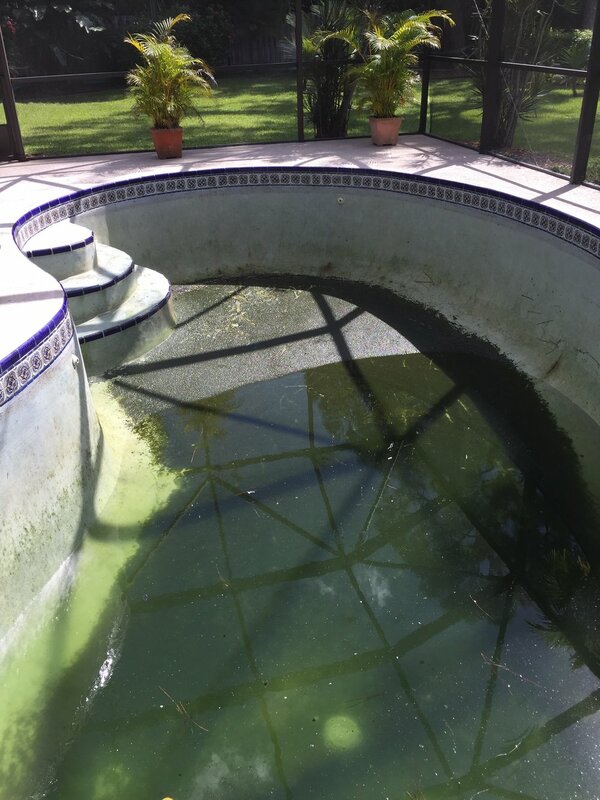 If you have algae that continues to return every few days no matter how much chlorine and yellow out you've tried, you most likely have a phosphate issue. We're experts in treating algae. Contact us today for treatment! There are 3 main types of pool algae. Black algae is relentless. It prefers the extreme heat of the summer water. It rarely if ever grows in colder water. It spreads rapidly and takes hold fast. Unlike any other algae, it roots itself into micro holes and fissures in the pool surface and has multiple layers that even protect it from chlorine! If caught early on, hard brushing with a metal pool brush to disrupt the most protective outer layers and treating the pool with "Tri-chlor" can penetrate the algae's root and terminate it. However if left to fester too long it can actually damage your pool surface. At that point the only efficient method of removal is to drain the pool and acid wash it. Acid washing is extremely effective in killing the black algae, as it burns through all the protective layers and penetrates down to the root. 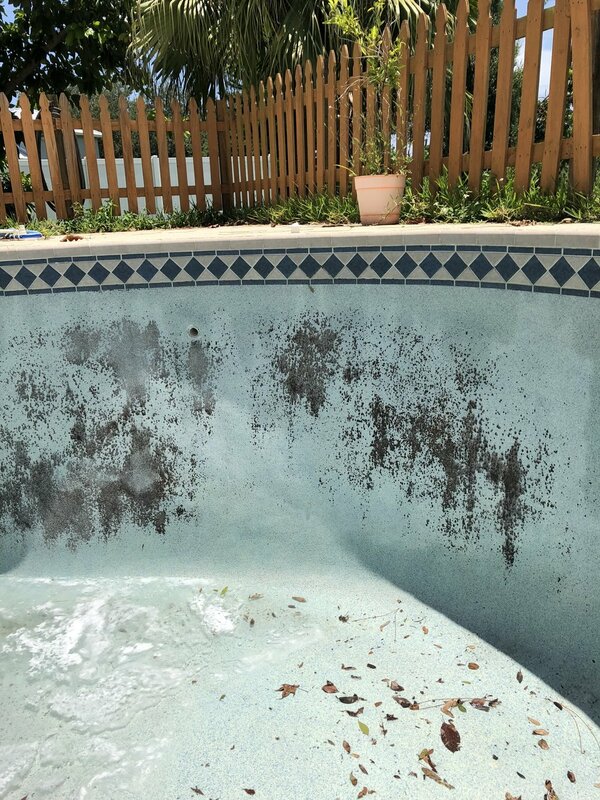 The longer the black algae is allowed to grow, the bigger the chance of residual staining even after an acid wash. Leaving it too long also increases the chance of damage to the integrity of the surface. If you see black algae treat it immediately. If you've waited too long already contact us for solutions before it's too late! Why did my pipe break?? A broken pool pipe can be worrisome and there are many reasons why they can break or crack. Ground Shift or Settling is a very common cause for broken pipes in South Florida. Especially after long periods of heavy rain. The shifting sand can add pressure on a PVC pipe and cause a small crack in a weak spot. Further erosion from the small leak itself can cause more shifting which in turn can enlarge the break. PVC lines can become brittle over time. Especially in older pools and/or if lower grade PVC was used during the original construction. 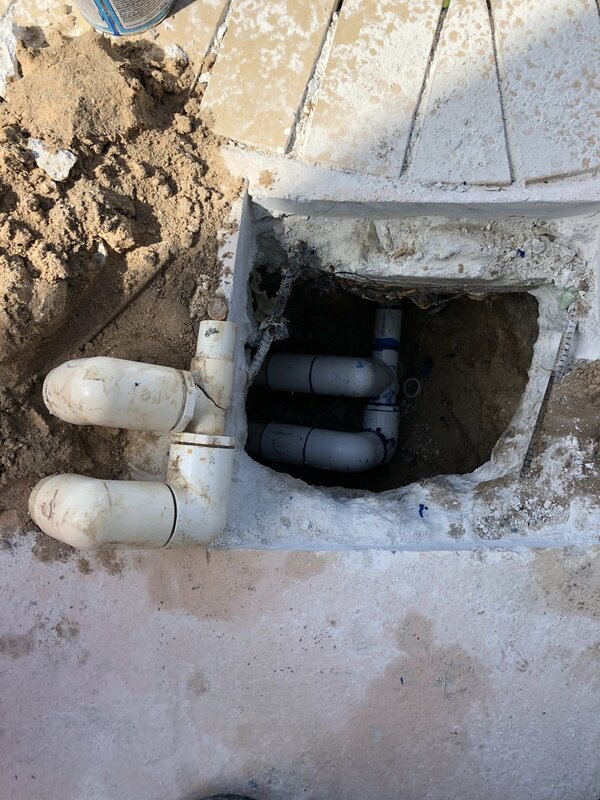 Improper Installation during the original construction of the pool, in which pipes that don't quite fit are forced into place, can certainly cause line breaks. The forced or distorted pipe puts pressure on the connecting fittings and eventually causes them to crack. This can happen in weeks, or take years to show itself. It can happen after the PVC fittings have become brittle or just in conjunction with minor settling. Tree and Shrub Roots are one of the most common causes of broken PVC pipes. Roots tend to grow towards water and are naturally drawn to the pipes, eventually growing around them and cracking or completely crushing the lines. Ficus Hedges and Australian Pines are probably the worst culprits, as are certain larger Palms. Pool leaks can become costly if left unfixed. Aside from the obviously high water bills, a leaking pool can cost you big money in other ways. Chemical Usageis drastically increased due to the constant addition of fresh water. Erosion from underground leaks can create large air spaces leading to cracked or sinking pool decks, or worse yet areas of deck collapsing. Health can be affected by various water born bacteria in pools that are leaking due to constantly diminishing chemical or levels of chemicals kept too high in an attempt to overcompensate for water loss. 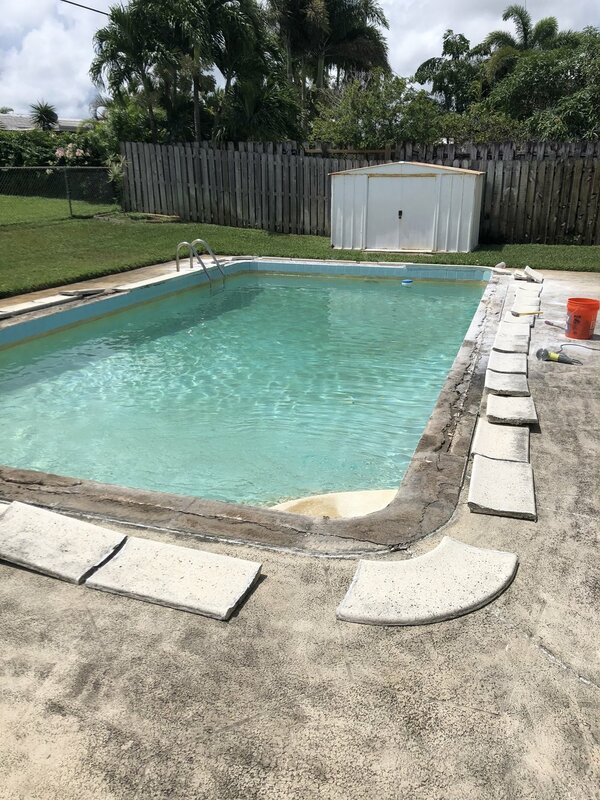 Pool Surface and Tile will become stained and/or discolored over time from the chemical fluctuations and repeated introduction of city water. This is especially true for well water. The increased risk of potential algae blooms in a leaking pool can also cause staining and discoloring. 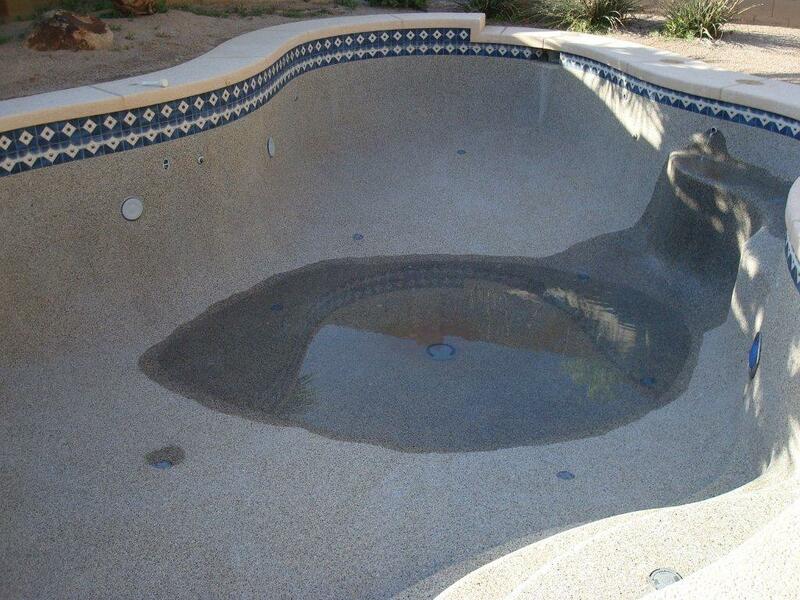 Draining the pool for an "acid wash" or resurfacing can become extremely costly. Check out our Groupon for 50% off a full leak detection! Enjoy huge savings on leak detection with $175 off of $350! Pool leaks are a drag and can end up costing more in the long run if left unchecked. Underground erosion, high chemical bills, and high water bills just to name a few. Contact us today to schedule your leak detection! 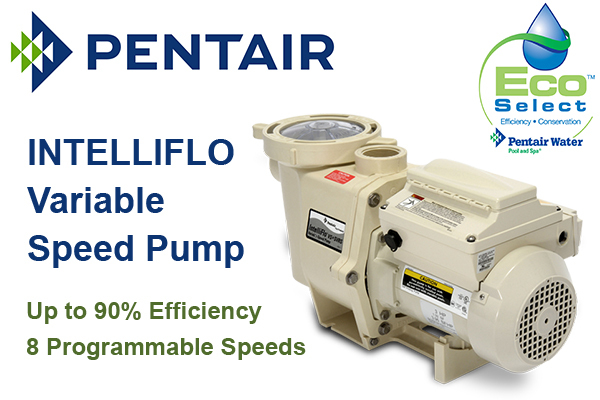 Variable speed pumps are quiet, super energy efficient, and flexible for all pool aplications. They are designed to move more water using much less energy than single speed pumps. The upfront cost is considerably higher, but the benefits are staggering. I explain to customers that a single speed pump is a purchase, whereas the variable speed pump is more of an investment. There's a noticeable savings on your electric bill. Enough savings that the pump pays for itself in 12-18 months! They last much longer due to their quality and design, and can be run at even LOWER speeds during the cooler months for increased savings. Variable speed pumps are by far the best option for any pool owner. Contact us today for pricing and more info! While pool season may be in full effect in South Florida, so is the nasty weather. Swimming pool safety is already an extremely important topic of discussion with the number of pools per capita in the state, but the topic of swimming and lightning is a topic in and of itself. Florida is the lightning capitol of the United States with 17 of the top 30 highest lightning cities in the entire country. The state averages upwards of 1.5 MILLION strikes per year. A staggering 90% of those occurring between June and September. 1 in 10 lightning strikes result in death, typically most of which are by cardiac arrest. There have been 5 reported deaths from lightning strikes in 2018 alone. A typical lightning strike can reach temperatures near 50,000 Fahrenheit, and can be as far as 10 miles out from heavier rainfall. Am I trying to ruin your fun? NO. Not in the least. My Job is to make sure you enjoy your pool to it’s fullest potential and I take it very seriously. I’m just trying to bring awareness to a real and potentially deadly threat from our otherwise beautiful environment. 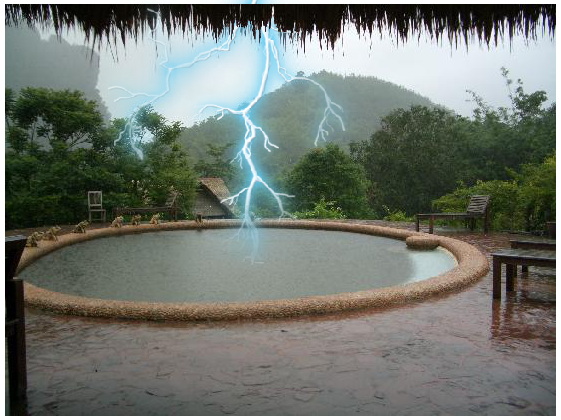 BOTTOM LINE, the rule of thumb for pool lightning safety is if you HEAR THUNDER, it’s time to get out. I suppose the best start to a Swimming pool blog would be the history of the "pool" itself. In modern day it's estimated that there are roughly 10.4 million residential pools in the United States alone, with an additional 310,000 commercially operated pools. It's common belief that the earliest known pool was in Pakistan. It's known as the "Great Bath" and dates back to almost 3000 BC! The pool was approximately 39 long feet by 23 feet wide and reached a depth of almost 8 feet deep. There were also swimming pools in Roman times where Emperors also kept fish. "Piscina" is one of the latin words for pool. Somewhere in the first century BC, Gaius Maecenas of Rome had commissioned one of the first known "heated" pools. Between the 6th and 8th century BC, n the 6th to 8th Century BC, the Greeks had rooms where they would go to play ball games, practice fighting and wrestling, and other various exercises. In those areas were also pools for social events, as well as bathing and swimming. In 2500 BC, there are also historic records of swimming pools in Assyria and Egypt. Just short of 300 AD, the Romans commanded an absolutely amazing pool with a footprint of over 900,000 square feet! It included large underground fires beneath the floors of the pool to heat the water, and was used mainly for public bathing. In about 36 AD, there are records of swimming competitions described in historic Japanese records. Britain was introduced to swimming as a social event by Romans as early as 78 AD. In the very early to mid 1800's Sweden and Germany show records of the development of "Acrobatic" swimming, swimming "Clubs" were established in England, as well as England documenting the most likely first "indoor swimming pool". 1885 saw the first recorded "diving competition" in Germany. One of the first known public pools in modern times in the U.S. was built in Brookline, Massachusetts in 1887. In 1895, the Vanderbuilt Estate in Asheville, North Carolina, shows one of the earliest known private residential pools in the U.S. In 1907, the first known swimming pool in an ocean liner was built by White Star in a ship called "Adriatic". In 1910, the Edisons followed in the way of the Vanderbuilts and also built a private residential pool. The following year saw the founding of the first known governing body of pools known as FINA (Federation Internationale de Nation de Amateur). By 1912 the Stockholm Sweden Olympics had added Women's Swimming to it's list of events. It wasn't until the 1930's that hotels had begun using pools as "marketing tools". In Coral Gables, Florida, the Biltmore Hotel was one of the first hotels in the United States to market a pool as an amenity. It drew in HUGE Hollywood stars from the times such as Judy Garland, Ginger Rogers, and Bing Crosby to name just a few. This is also the decade that saw the earliest known pools formed from steel wire for strength before hand packing cement walls. "spray applied" using compressed air with material sprayed onto form boards to creat the shape. Towards the end of the 1940's is when the Gunite industry began to grow. Unfortunately World War II halted the industry to a crawl. Gunite is still used today in modern pool construction. The late 1940's showed the first of the large pool building companies. In the 1950's after the Korean War, pool construction saw a large upswing. Pool companies were popping up throughout Florida, Texas, New York, and predominantly throughout California. The National Pool and Spa Institute was formed to help unify standards in the pool industry in response to pool issues. Vinyl liner pools debuted towards the end of the 1950's as well as solid one piece fiberglass pools. It was also around that time that the concept of "pool financing" blossomed. Into the 1960's, filtration equipment became available, and PVC plumbing, skimmers, pool drains, and pool lighting. Perhaps the biggest introduction to the pool industry in the 60's was the "free formed" pool as opposed to the typical rectangular pool that preceded it. Califonia blazed the pool industry trail through the 1970's with Gunite pools being formed and sprayed into custom shapes and sizes. These were the first of what has been considered "high quality custom pools". In the 70's California experienced severe droughts which forced the emptying of tons of pools. ...Thus the skating/skateboarding industry started to blow up. The 1980's ushered in new materials and new shapes and water features as well as early pool "Automation" controls. "Natural Look" pools started to grow in popularity as well as overflowing walls known as "vanishing" or "negative" edge pools where water seemingly flows over the edge of the pool into nowhere. It wasn't until the 1990's that SAFETY finally became an important issue. With the introduction of "baby gates", stricter fencing regulations, and better designed automation. Today...in the future of now...there are pumps that instantly halt entrapment issues, drain covers that are anti-vortex, and automation that sends immediate alerts to your smart device if someone or something even breaks a pool's surface. With almost unlimited sizes, shapes, and building materials, incredibly complex automations controls, and quickly advancing technology, who knows where the pool industry will progress. Why is there air in my pump? Possibly one of the most common questions we're asked. Old valves or plumbing fixtures at the equipment that are drawing in air. Bad pump seals or lid gasket. A clog in a suction line. Filter cartridge that either needs to be cleaned or replaced. An older pump that is wearing out and in need of replacement. It's best to have a pool professional isolate the problem before further damage is caused. 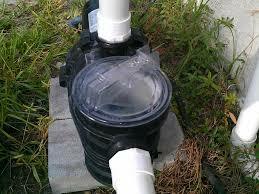 Pumps that run half-primed can overheat causing further damage to the pump and plumbing, or pump failure altogether.